What is it like to feel you are an island without escape? An island where the view is only that of your brilliant mate’s life fading away with each passing day? It’s not that often that I read a library book and want to immediately order copies for friends and start looking into an author’s other titles minutes after the last page has been read—this is just such a book. Toth’s husband James has Parkinson’s and she has watched the disease take over her husband’s life up close and personal like a thousand paper cuts. He was a lauded architect and active community member, they had a very successful marriage and a loving relationship always, then she was thrust into that position so many women find themselves in from wife to full-time caregiver. She is extremely candid about the hardships and frustrations to cope with one’s own energy and spirit amid the letting go of a mate you love and want to care for but the demands are relentless. The isolation is palpable. She describes the dreaded task of filling the med sets, a more complex one for her husband but also one for herself and the time it takes to get them both correctly allocated. No Saints Around Here is a powerful read and may serve you or someone you love to know they are not alone. As her husband James’s Parkinson’s disease with eventual dementia began to progress, writer Susan Allen Toth decides she intensely wants to keep him at home until the end. Wrenching, occasionally peevish, at times darkly funny, and always deeply felt, Toth’s intimate, unsparing memoir reflects the realities of seeing a loved one out of life. Another movie that details this issues of women’s health, this in Afghanistan is “Motherland Afghanistan” by Sedika Mojadidi’s, a young woman, who follows her OB/GYN father and general practice mother back to the country of their birth, to serve women with substandard healthcare and train medical staff. The first mission they went on was frustrating but he later became involved with Shuhada, to a hospital in the Ghazni region, and this experience was more satisfying. You can see how much Sedika’s parents want to help to rebuild a life for those they left behind in Afghanistan when they immigrated to the US in 1972. To see what these women endure when it comes to child birth and health care is something, many arriving on foot and days away from home. Afghanistan has the second highest rate of infant mortality. You also gain a sense of what all this poor country has lost in thirty years of war as the Doctors Mojadidi go back to see where the filmmaker’s father used to worship and live, their family’s compound having been bombed into dust. One wonders after watching this film what things are like for these women five years after this film was shot. Don’t miss this amazing movie, and A Walk to Beautiful, both about people making a difference and the issue of women’s health and education in the developing world. Madoff: Too Big to Fail? Perhaps the cooling off period has passed long enough ago you can read about Bernie Madoff without throwing down the periodical in utter disgust. I sought out a book to read about this after all the media coverage had died down, hoping enough time had passed that there would be a definitive look at this scandal. My curiosity was again peeked when I read of Ruth and Bernie Madoff’s second son’s recent death from cancer. Their other son took his life. You no doubt know the outlines of this story of a $65M Ponzi scheme but not all the details nor how many people put all their eggs in the Madoff basket and lost it all, wealthy people, not so wealthy people, charities, endowments, names your know many you do not. It is certainly a cautionary tale of how essential diversification is and how easy it is for people to fall under the spell of someone who seems so successful and sought after. I have since heard similar local stories including one from a fellow I met when trying to buy a dresser off Craig’s List, his parents and siblings had lost over 250K of their life savings investing with a guy he lead them too who was also running a shell game. It is everywhere. 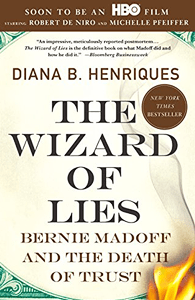 I chose this book Wizard of Lies as it was well-lauded and written by NYT writer Diana Henriques. One thing that always fascinates me is the fall out on the family and friends when someone goes so off course when following their moral compass. What Ruth’s life is like now, with both of her offspring dead and her husband in jail? This is something most cannot feel empathy for but it must be a lonely life having fallen so far and viewed as a pariah by so many. How does one rebuild being in she shade of such lies and deception? What is Bernie’s life like knowing he will breath his last breath behind bars. Food for thought indeed. To say that Novella Carpenter has had an unconventional life would be an understatement. She is an urban farmer in Oakland California and is quite the talented writer. Her book Gone Feral is about her search to find her father and to try to piece together why he had been so illusive in their lives and what that means to her as a woman hoping to begin her own family. She has a great writing style and her father loss is apparent as does her need to try to understand what would lead a man to abandon his wife and two young daughters. Listen to her interview on KQED‘s program Forum and then read her book and perhaps like me you will want to read her book about her urban farming.